Padraig Harrington and Damien McGrane believe it’s only a matter of time before Shane Lowry rediscovers his Irish Open magic. Lowry is learning his trade.The Clara hero, 22, shocked the world when he won The 3 Irish Open as an amateur just seven weeks ago. But after watching Lowry make the his first cut as a pro in last week’s French Open, the tour stars reckons it won’t be long before he’s a regular title contender. Triple major winner Harrington said: “Last week was the first time I met Shane and it was nice to get to know him that little bit better. “He showed in winning the Irish Open he certainly has a very good golf game but now that he is out on tour there is so much to learn, and it’s something you can’t learn overnight. “It took me time to get settled out and it’s going to take Shane time. He’s going to have to learn about travelling about Europe and other aspects like what airport to fly into, where to stay and basically just how to manage himself out on the tour. 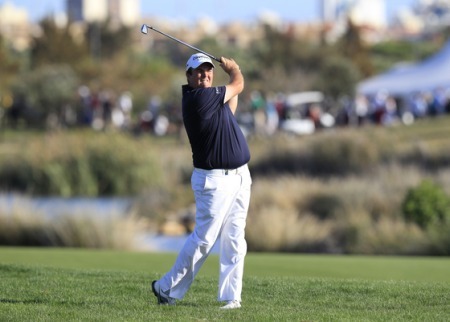 Lowry missed his first three cuts as a pro but pocketed €16,800 for a share of 50th in France. And he certainly impressed McGrane who played alongside him for the first two rounds. McGrane said: “Shane is a very, very talented player and he hit some beautiful shots over the two days I played alongside him. He’s got a lot of game and all Shane needs out here is a little bit of time and he’ll do nicely. Shane Lowry plays his second shot to the 18th in the third round of the Portugal Masters. Picture by Eoin Clarke/www.golffile.ieShane Lowry remained on course for his first victory as a professional as Padraig Harrington went into reverse in the Portugal Masters at Oceânico Victoria Golf Course. Shane LOWRY keeps his head down during the first round of the 2013 Aberdeen Asset Management Scottish Open. 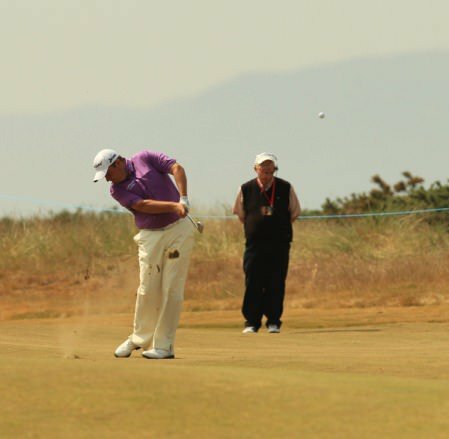 Picture Stuart Adams www.golftourimages.comShane Lowry insisted he was putting thoughts of Open Championship glory aside as he got his bid for the Aberdeen Asset Management Scottish Open off to a scorching start with a super 66 at Castle Stuart.